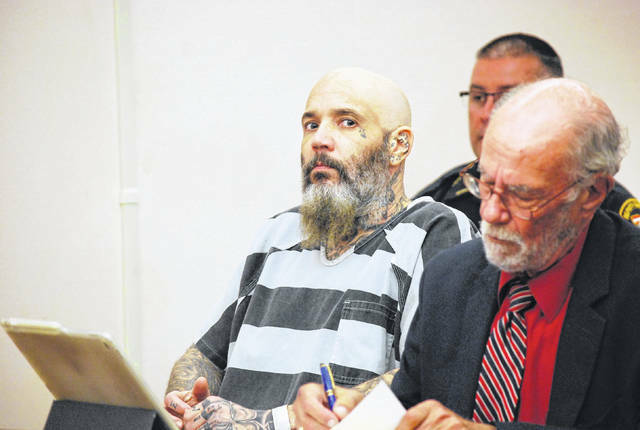 John Russell, 44, of Lima, waived his right to a speedy trial during an appearance Tuesday morning in Allen County Common Pleas Court. Russell is charged with kidnapping and abduction resulting from a domestic violence incident. LIMA — A Lima man charged with abduction, kidnapping and domestic violence for allegedly beating his domestic partner, threatening her with a knife and holding her against her will is scheduled to stand trial Oct. 2 after waiving his right to a speedy trial. John Russell, 44, appeared in Allen County Common Pleas Court on Tuesday to formally forfeit his constitutional right to a speedy trial. Judge Jeffrey Reed set a tentative date of Oct. 2 for a jury trial to hear the charges against Russell. Russell was indicted in May by a grand jury on charges of kidnapping, a first-degree felony; abduction, a felony of the third degree; and domestic violence, also a third-degree felony. Court documents show that police were called on April 17 to an apartment on Mound Street in reference to a domestic violence dispute. The alleged victim in the incident, Kimberly Warren, told police that she and Russell got into an argument the previous evening at 269 S. Roberts St., Lima. Warren said the argument became physical when Russell punched her in the face, slapped her several times with his cell phone, pushed her into the bathtub and held a knife over her while making threats to kill her. Warren also told police Russell would not allow her to leave the residence. On the morning of April 17, according to court records, she received a text from her mother to come and pick up her grandson. Warren talked Russell into driving her to 1808 Mound Street to pick up her grandson and, upon their arrival, Warren’s mother noticed the physical injuries on her daughter and called police.